As a direct result of fluoridation, dental health in our part of the world turned around dramatically. The improvement is evident in our children, fluoride in our water reduces tooth decay in children by 50 percent. Why then, are some put off by the idea of fluoride? It’s true that excessive levels of fluoride can actually damage tooth enamel—too much of any good thing is too much. But continuing research, down to the molecular level, proves the bottom line: fluoride is good for us. With fluoride, bacteria are disarmed, plaque can’t get a foothold. Teeth and gums are nourished. If you and your family drink bottled water or use a filter on your tap, you may not be receiving the benefit that fluoride provides. Many home water filters remove approximately 90 percent of the fluoride from tap water. And fluoride levels in bottled water are often non-existent. We may opt to give children a head start by direct application of fluoride here in the office. 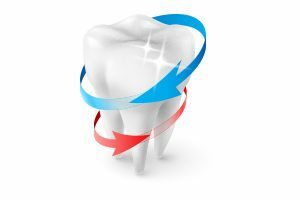 People with periodontal problems show encouraging recovery with fluoride gels and solutions. Older patients can benefit too. With topical fluorides, adults enjoy 67% less decay on the root surfaces of teeth. At home, fluoride-fortified toothpastes and rinses don’t hurt either! Along with our concerns for your whole health, we welcome the benefits of fluoride—an important part of our preventive practice. And plain good sense.